JACKIN.cz - In the beginning there was Jack… and Jack had a groove. 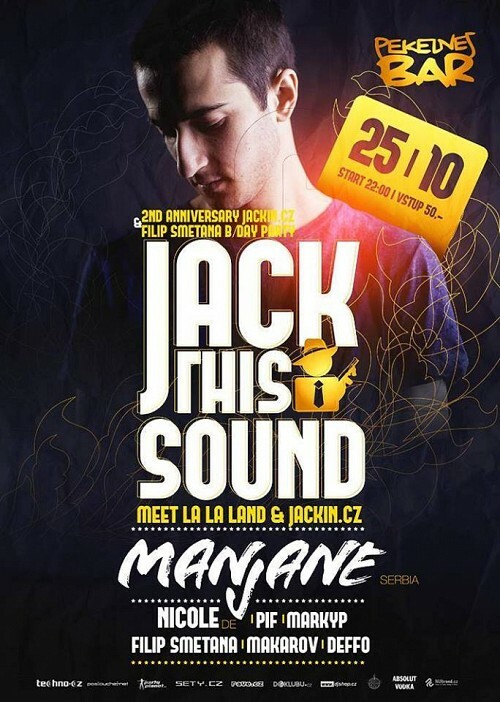 Manjane is playing at Pekelnej Bar 10/25/2013 on Jack This Sound Action. - Hi Manjane, from your birth name it seems that your DJ and producer alias "Manjane" was some sort of anagram? - yo! yes, my birth name is Nemanja, so Manjane is sort of anagram... I started with that nick when I was 15 and it stayed for years. - Looks like you also bring there little "french" souding touch not only to your nickname, but also your music? What was the influences for you to start djing and producing? - I think you meant Spanish touch to my nickname? Mańana means tomorrow... so people sometimes like to make jokes and call me "hey dj tomorrow" lol. Anyway, yes, french crew like Daft Punk, early Roule, Blackjack, and all that french/filter house era had a big impact on me. I started with that, and later on I found familiar stuff from Chicago... imagine 15 year old kid listening to a Derrick Carter mix for the first time. I was blown away! It was a huge and fresh thing for me. - You started pretty early, 15 years old (Manjane is now 21), what was first - producing or djing? - I started out as a DJ. Very soon started to produce my own stuff because I wanted to have something exclusive in my sets. The first tracks werent so "exclusive", ha. But it kept getting better with each track. - From what I heard, you play and produce mainly deep/jackin/tech house, but like to put some serious instruments on it, is that correct? How would you describe your style? - lets just call it house music! House influenced by Chicago & Detroit sounds. Sometimes it goes deep, sometimes funky, but its always the good old house music.Rhodes is my favorite instrument and I love when producers add some smooth rhodes chord action to their tracks. - What do you think helped you the most on your journey from the 15 year old kid to now, where you are living the music full time and getting respect from djs and producers worldwide? - Being patient and workaholic. I need to make at least one minute of music every day or else I feel bad. It is since the day one! Every day Im watching tutorials, trying to push my sound forward, taking advices from more experienced producers and djs. Oh yes, making mistakes too. Thats what makes good music better. - You live in Belgrade, Serbia, how would you describe the scene in Serbia? I suppose there is mainstream house and underground scene, how do you manage between those two? - Belgrade is doing fine these days. Local artists and enthusiasts are the ones who are keeping the scene alive! But I feel that mainstream and underground scene are far from each other. - What are your plans for near future? - I made a new side project with my great friend Just Voya, so we are making lots of new music these days. At this moment trying to set up my own label and a monthly party in Belgrade. Also, Im finishing my first downtempo album with Mushroom Jazz influenced style beats. - You use Ableton for producing and mastering, can you give me one thing you think is comparetively to other programs the best and the worse? - There is no such thing as bad in Ableton! lol. I never actually worked too much in other programs, but I think Ableton is the fastest one. You can get your ideas sequenced in no time! - Since you do also mastering of tracks of other producers, is there some common problem you find the most difficult to face when you are mastering? - Yes. Dont overdo your mix! leave some headroom and every mastering guy on earth will love you. - Have you ever been to Prague or what you have heard about it? - This will be my first time in Prague :) heard nothing but great things about it and im very excited to come. Everyone is talking about the Czech beer so... khm! Cant wait! - Since some fans in Czech Republic might not know you, can you tell us what we can expect from you live in Peklo (Pekelnej Bar)? - We will be also celebrating two years of "jackin.cz" which is also kind of celebrate of two years of bringing high quality underground djs and producers together. Are you prepared to get wild and have fun with us? - Congrats guys! Excited to be there on this anniversary. As I said before, very looking forward! - We are so looking forward to have you in Peklo, thank you for your time and effort with providing us exclusive mix. Copyright © 2013-19 JACKIN.cz. ENG! Hosted on PIXHOST. Powered on PIXCMS. Created by Jakub Křibík for PIXMEDIA.